Tuesday night I faced one of my greatest fears—speaking in front of a group of people. Thankfully, this was a wonderfully supportive group, and they did their very best to make me comfortable. I appreciated their warm smiles and words of affirmation, yet I still found myself literally shaking and unable to breathe normally. I was frustrated and angry at my inability to overcome my illogical fear. Yet, looking back, I can rejoice that I did it, thanks to God, and that is good. In spite of my fear. In spite of my insecurity. In spite of a lot of things—I did it. And I am glad. But so many other times in my life, I haven’t done a thing. When facing times of decision, I’ve let many reasons or excuses hold me back. 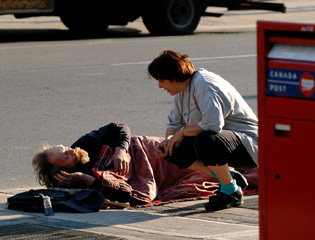 What would happen if I reached out to that homeless person? What would my friend think if I told her the truth? What would my students do if I couldn’t make it all the way through a lesson? And, finally, how can I ever really know if it’s God who wants me to do something rather than just my own ambition and pride? So many unknowns that have held me back and doused the flicker of faith that longs to become a flame. These questions and doubts are deceptions and snares. Gently camouflaged yet deadly to the hope of living an effective life of faith. As my husband likes to say, “They smell like smoke and come straight from the pit of Hell.” And, don’t tell him I said so, but in this case, I think he is absolutely right! After all, what better way to stop the progress of the gospel than simply to fill believers’ heads with insecurity and indecision? Doing nothing is the easy thing. It requires nothing, and it leaves us feeling numbly comfortable. It’s not as though we have done a terrible thing. God just didn’t make His will clear enough for us. We prayed and waited and in the meantime the opportunity to impact the world slipped slowly by. At least we didn’t make a mistake. But a life of faith requires risk. It is clear in the lives of those who have gone before us, those heroes of the faith who all had liberal amounts of mistakes mixed in among the victories in their lives. It is even clear in our greatest example of faith, Jesus Christ. He faced the greatest risks we can imagine—ridicule, scorn, physical and emotional pain, and even rejection from his family and friends. He chose to act in faith and “scorned the cross” (Heb. 12:2). He faced the risk and overcame the fear that could have kept him from acting. Think about it. It wasn’t even his sin that needed to be atoned for. But he knew his Father’s will and he did what it took to obey—even all the way to the cross. And we can and should do the same. What does the Lord require of us? To act justly and to love mercy and to walk humbly with him (Micah 6:8). He wants us to do something! To give a cup of water. To offer the Bread of Life along with a physical meal and company as it’s eaten. To be a fearless word of truth in a time of truthlessness and a sympathetic ear in time of need. Something. Anything may be better than nothing. Are you praying about something you’ve been asked to do? Are you waiting to receive a sign from Heaven? Is your present filled with indecision and your past with regret? Are you still alive? Then now is the time to act. Today is the day the Lord has made. Let’s do something good in it! Maybe this message would have been more powerful if we hadn’t received the news that we were praying for. But the pathology report was just what we’d hoped: Benign! No cancer! Yes! And I rushed to share it with all the social media power at my finger tips. Word spread quickly and messages came back: “PTL! Hallelujah! God is good!” Oh, yes, He is. And I rejoiced along with my friends, echoing their words of praise and encouragement. God IS good! But at the same time, my logical and sometimes detached brain couldn’t stop from pondering the idea that even if the report had not given us the answer that we’d hoped for that God would still be good. Wow. But it’s true. Even when our house is the one the tornado hits. Or our car is on the bridge when it falls. Or when we are the ones that lightning strikes. Or, God forbid, when our child is the one with cancer. Even then. Oh God, even then, You are still good. Do I really believe that? Today it is easy to say, “Yes!” I am still basking in the afterglow of that good report. All is right with my world. My daughter is healthy. But do I really believe it? I can’t honestly answer without facing and passing the test. But I can point to those who have. Friends who testify that cancer was the best thing that ever happened to them. Others who have experienced the loss of jobs or homes and shared the deepening of their faith and their testimonies to God’s provision in their lives. They tell me that they know, and I am glad to rejoice vicariously with them in that truth. Even the Apostle Paul, who penned these words to the Philippians, stands as an example to me of one who faced many trials yet could still rejoice in the knowledge of God’s eternal goodness. And even write the words “Rejoice always” from the dark depths of a Roman prison. But until that day, in the weak yet growing faith of my inexperience, I rejoice. In the passing over of disaster. In the restoration of my daughter’s future. In the good news that all is well. May I be ready to rejoice in the days it is not. Hallelujah! Rejoice in the Lord always, and again I say: Rejoice! “… to another gifts of healing by the one Spirit” (1 Cor. 12:9). A week ago, I wrote about expecting miracles. Like Shadrach, Meshach and Abednego, I knew that God was able to perform miracles and acknowledged that he could rescue us from any fire we had to face. I even shared a specific fire—my daughter’s upcoming surgery—and stated that I was praying for God to dissolve the nodule on my daughter’s thyroid so that she wouldn’t have to face surgery. Yes, I wrote that God was able, but like those three who faced the furnace, I didn’t know if God would choose to rescue her from the fire. And in this case, God’s answer was to allow that nodule to remain right where it was. In other words—no miracle. I admit to having more than a little disappointment on Monday when the ultrasound tech didn’t say, “Whoa! The nodule is gone!” and instead, Sarah had to go through with the scheduled surgery the next day. I really had believed—although skeptically—that it would be gone. I was a little embarrassed by my childish hope, but I do know others who have been healed supernaturally. Why not Sarah? Even this past week, my doctor husband had experienced two separate occasions of unexplained “healings” as he passed his hands over painfully ailing patients. Within minutes, on each occasion, his patients’ terrible pains had totally vanished without explanation. He joked with me that he had healed them just by touching them, but neither he nor his amazed physician’s assistant could explain it. I could see that it had awed him, but still, no miracle for our daughter. Yes. I was disappointed, even a little hurt by it all. But, was I too hasty in making my call? Were there miracles at work that I had missed? It could be so. It is only as I ponder the events that I see what I could easily have missed. God was definitely working. When the doctor called from the operating room to tell us Sarah was doing well and they were waiting for some lab results before closing, he told my husband, “God’s angel was watching over her.” It is amazing, but the last words in my article last week were, “Praise be to the God of Sarah, who has sent his angel and rescued his servant!” The doctor had used almost the same words to comfort us. A miracle? Perhaps. And that’s not all. When this whole process began, we had gone to a wonderful ENT whom we trust completely, but he decided to send us to his mentor, a doctor who it is difficult to see and who has performed this surgery many, many times—a true expert. He had explained the procedure to us and had shown us the delicate nerve that he would have to move aside in order to remove the nodule and one-half of her thyroid. This tender nerve was what concerned us all as Sarah is a singer and injury to it could have permanently damaged her voice. When the surgeon called us back after the operation was over, the first thing he told us was that Sarah had a terribly thin and difficult nerve which had unusually branched in three directions, and he had had a tough time “teasing” it aside. I almost couldn’t listen any more fearing the worst, but then he said, “It was tough, but when we tested the nerve it was firing just fine.” A miracle? Maybe so. Another odd occurrence also reminded me of my prayers and told me that God had been listening. The doctor next told us that he hadn’t been alone in the operating room. There were several Japanese surgeons also there. They had come to watch his minimalist approach to this operation, but I was reminded of the three men in the furnace and my hopes that Sarah, too, would be joined by that “fourth man.” Japanese surgeons weren’t what I had in mind, but the idea triggered my memory and was a private joke from God to me. He was watching, and he was with her. Again, a miracle? Not to anyone but me, but I couldn’t ignore the possibility. And now, two days out, Sarah is healing well. The swelling is already going down, she hasn’t taken any pain medication since yesterday, and her voice, although still a little weak, appears to be fine. She is being healed. Not in the ways that I may have wished, but miraculously all the same. And may it be said, “Praise be to the God of Sarah, who has sent his angel—and his particularly chosen surgeon with the gifts that were specifically needed—and rescued his servant!” Amen. “If we are thrown into the blazing furnace, the God we serve is able to save us from it, and he will rescue us from your hand, O king. But even if he does not, we want you to know, O king, that we will not serve your gods or worship the image of gold you have set up” (Dan. 3:17-18). All you great expositors out there will just have to skip this week’s article. I’m throwing context out the window and using this verse to serve my own purpose in good old topical sermonizing. But, truly, it’s not my fault. Every time I’ve thought about my daughter’s upcoming surgery, I’ve been reminded of these three men, Shadrach, Meshach and Abednego, and their deep, abiding faith. I know the context is very different. They were facing the fire for not bowing down to idols, and we are facing the unknown of surgery and an unsure diagnosis. But, here is where I keep making the connection. They trusted God for whatever their future would hold. They knew that He was able to rescue them—they just didn’t know if He would. But either way, they were casting their lot with Him. And that’s where I can’t shake the similarities. Since her diagnosis with a follicular nodule many months ago, I have prayed asking God to remove that growth so that she (and we) wouldn’t have to face the fire of undergoing surgery and the slim possibilities of negative side effects or further surgery. I have known that He is able to heal in a miraculous way, but I haven’t known if He would. And to date, that nasty little nodule is still there. As we approach next Tuesday, I am still asking God to take it away, but I confess that I have my doubts. Odds are that come Tuesday morning, my sweet girl will have to undergo the surgical removal of that nodule and half of her thyroid. And that really makes me mad! But, that doesn’t change my belief that God is able. I know that He is. I know that God can heal my daughter. It may be through a miracle or it may be through the gifted hands of her Christian surgeon. But I know that He is able, and no matter the outcome, I am thankful that she (and we) are in His hands. I know that He can. No matter the trial, no matter the fear, no matter the pain, no matter the doubt and skepticism of my logical brain. God is able. And I know that when my daughter is rolled into the operating room next week—barring a miracle—there will be an extra person there with her just like there was in the furnace with Shadrach, Meshach and Abednego. One who looks like the Son of God. And may it be said because of this trial, “Praise be to the God of Sarah, who has sent his angel and rescued his servant!” Amen. I have slowly been working on what I have foolishly referred to as “my” master’s degree in Christian Studies. There have been some ups, and there have been some downs. And right now is a down. I feel as though I have landed in a puddle at the bottom of a sinkhole. I know I shouldn’t be surprised—tuition hikes have been all over the news—but I just took a look at costs for the fall semester and was shocked to find that it has jumped $15.00 per credit hour! That is $90.00 more per semester, and I’ve barely made a dent in what it will take to complete “my” degree. Now what? How much more will tuition rise before I see the completion of “my” degree? Will I even be able to finish at all? But I guess that’s what faith is about. Hebrews 11:1 says, “Now faith is being sure of what we hope for and certain of what we do not see.” Nope. I can’t see why I’m putting myself or my family through this. The study time and the stress it produces are fine. I actually enjoy that part. But, Lord, why does it have to be such a strain on our budget? That’s a burden that I am loathe to ask my husband and the rest of the family to bear. And it may prove to be too costly to justify for a pursuit that is so unclear. So here I sit. At the bottom of the sinkhole, looking up at the open sky. A little bruised. A little bloodied. But okay, God—now what? Should I build an ark? Should I give birth in my old age? What do you want from me today? Feed my sheep … Keep your eyes fixed on me, and get ready. Okay, God. One more day. I’m looking up to catch your vision and moving forward–right after I climb out of this hole.